Piri Piri in Swahili means Pepper Pepper. It is an African bird’s eye chilli which is very hot. 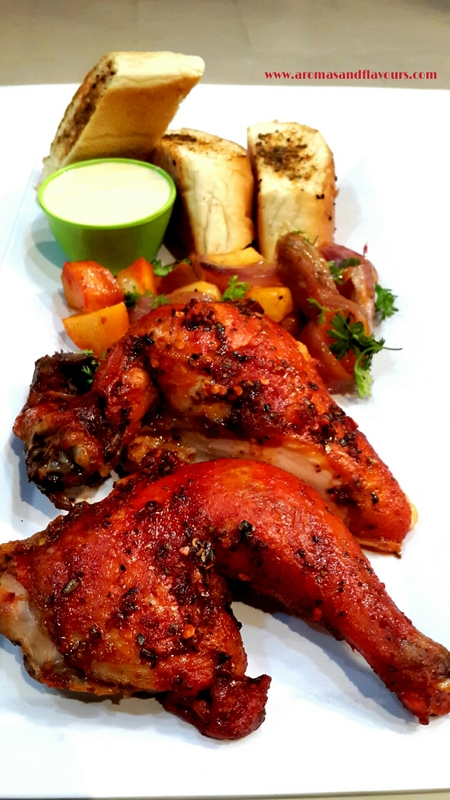 Piri-Piri chicken has its roots both in Africa as well as in Portugal. The amount of chili used in the dish can be increased or decreased to suit one’s own palate, depending on how hot you want it to be. This dish is made with bird’s eye chili. If it is not available you can substitute it with cayenne pepper, paprika and red chili flakes. If you chose to go exactly with this recipe, it has just the right amount of ingredients and is not very hot. The brown sugar balances the spice level very well besides caramelizing the chicken and veggies beautifully. My daughter is fond of Piri-Piri chicken and no way was I going to order it from the local joint during her exams. So, I made this dish at home from scratch( I didn’t want to use the store bought Piri Piri sauce either). 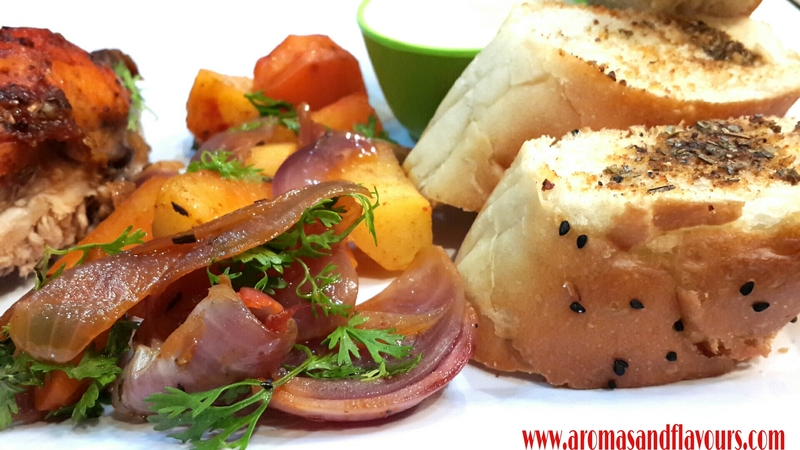 I served it with toasted garlic bread, roasted potatoes , caramelized onions and a delicious Musk melon dip which I ….er..ahem..invented 😉 experimented (whichever sounds more modest lol ) The melon dip was an instant hit and it went well with the chicken and the bread. Actually it deserved a separate post. As I have mentioned in my previous posts, I love to brine and spatchcock my chicken before grilling. (you can skip brining if you want, but it makes a lot of difference to the end result). Brining makes it moist and tender where as spatch cocking it ensures even grilling. Mix the first set of the ingredients in a bowl and brush it on a well rinsed, brined and spatch-cocked chicken. Leave it in the fridge covered over night or at least 6 hours. Brush a grilling pan with oil and lay a bed of potatoes. Then layer it with onions. Now spread the marinated chicken over it like a butterfly. Grill in a pre-heated oven at 200º c for half an hour. Reduce heat to 180º C and grill further till done. The juices should run clear when the chicken is poked with a skewer. It should take 45 min to an hour depending on the size of the chicken and hours of marination. Note: If possible grill it outside on a charcoal grill. But it works beautifully in the oven too. The advantage of making this in the oven is that the vegetables get cooked along in the same pan. The brown sugar in the recipe drips on the onions and caramelizes them beautifully. Mix them all and whip for a minute. Keep it in the fridge till you serve. Cut thick slices of the baguette. Mix the seasoning with oil and brush on top of each slice. Grill on a wire rack at 200 º C for 5-10 minutes. Enjoy this tasty meal with friends and family . I am taking this platter to all my FF friends.Fiesta Friday is hosted by Angie@The Novice Gardener and is being co-hosted by Jhuls @The Not So Creative Cook and Mila @milkandbun. Previous Post Hummus with Spinach and Olive(s)- A New Menu for Popeye? Next Post Kataifi Chicken or What Ever!!! Sounds fantastic!! I love Piri-Piri!! Thank you Elyann 🙂 It was an awesome meal. Now that looks yummmyyyy!! And would be an awesome combination!! Thanks Nitali 🙂 The subtlety of this dip goes very well with the hot chicken. I shall be thinking of this act of kindness for the entire day and wish it come to pass — even if its for someone else! Great story, and isn’t it amazing how you’ve adopted the same idea from your mother (feeding your daughter during her exams)? 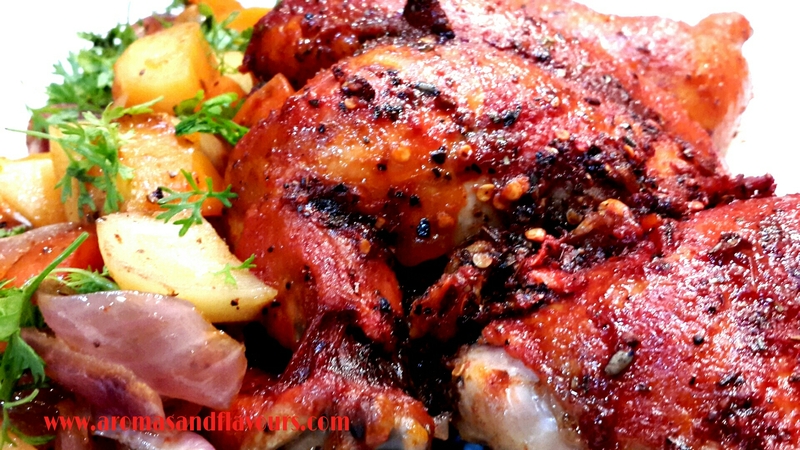 I love piri piri and have several recipes that I’ve tried over the years, now I’ll add yours to the rest. It looks gorgeous! Thank you Loretta ☺ This version of Piri Piri is a mild one and can be spiced up by adding more chili. But personally this suited my family’s taste. And yes my grandmother was a gem of a woman and her tales always had a hidden message. Looks great, love piri piri!! I love that you made this from scratch for your daughter. Thank you Suzanne ☺I didn’t like using the bottled sauce especially when its so easy to make. This is an absolutely lovely dish, skd! From the flavors (the heat sounds just right!) to the gorgeous color. I say please, please for some chicken piri piri! Most welcome dear Jhuls. I think the piri piri wants you to eat it that’s why it keeps coming in front of you repeatedly, just what your mandi did to me 😊 Thank you for hosting the FF. Have a nice weekend . Ooh! I just came in from the garden with an armload of musk melons. I’ll have to try that dip! Thanks for sharing! Wow! Thats awesome. Please do try it. This looks like a must make! I have always wanted to taste this, and I think the only way I will is to make it! My mouth is watering, i swear! You can increase or decrease the heat to your liking. I love every part of this wonderful meal. 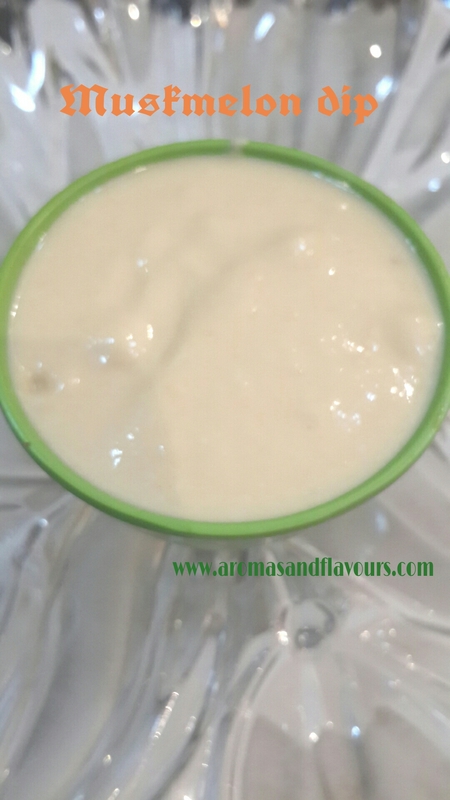 The musk melon dip is a very clever (invention) accompaniment. Thanks Michelle. I am pretty much the same 😊Especially when eating with kids have to opt for the milder version. Thank you dear Indu. Together it made a wonderful meal. Everyone loved the dip because it mellowed the heat beautifully . The things that mothers do for children. This looks so good (but labor-intensive!) that I am certain your daughter starred on her exams. Great recipe, I’ve been trying to re-create Nando’s and even if this isn’t quite the same, it looks absolutely superb. I can’t wait to try it. Thank you so much ☺ This recipe is slightly different from the Nandos recipe. It turns out delicious whatsoever. Thank you so much for liking ☺It is slightly different from the Nandos recipe but whatsoever tastes delicious and can be enjoyed by the entire family starting from kids to adults. Do try it. Wondering if I can use honeydew melon instead of musk melon? I think they have musk melon in north India but not down south in Kerala. Looks fantastic! I think you can. Just maybe it wouldn’t need additional sugar. 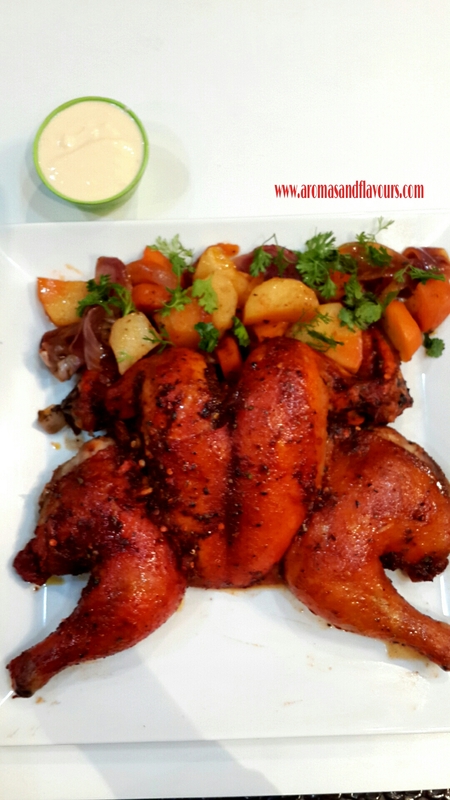 I tried it and it was amazing…but I used kashmiri paprika and dark vinegar instead…thanks for the post…was looking out for a good piri piri chicken recipe and found it!… Waiting to try the musk melon dip! Actually ty fr the recipe..looking forward to more amazing recipes…I’m just a beginner to blogging but cooking s so much fun! The pleasure is mine Lina. I have had fun browsing through your blog. Will bookmark some recipes and try them over a weekend. All the best with your blogging. You will soon find the wordpress community a very warm place to be. Have had peri peri /piri piri chicken wings at a Portuguese restaurant in New Bombay twice and they were lip smacking and finger licking good , but your pictures clearly tell me that I have yet to taste the real thing !!!! Simply yummylicious looking dish ! Aww…That’s a beautiful thing to say! ! Thank you so much for the kind words ☺ Please do keep visiting. I like your blog . Especially the titles of your posts are amazing. Thank you . Am humbled ! Thanks a ton . You really made my day .